10/29/2004 1:46:11 PM Mountain wlj:: looks like repeat of 90 deg ago, a run up in to vert pluto. good dog. 10/29/2004 1:27:53 PM Mountain wlj:: you have done well grasshopper. 10/29/2004 1:25:21 PM Mountain mjs:: Time for me to go. Next 2 weeks work for Merrill Lynch so can only check charts in hotel. Buying $100.000.000 of mortgages. See you in 2 weeks. 10/29/2004 1:17:27 PM Mountain mjs:: Grinding, very slow. News is all from this morning so all old news. Briefing.com says possible good news Monday so up MKT. 10/29/2004 1:06:31 PM Mountain mjs:: Looking at Tide32 realized we may have shifted tides around 1300 and now on green. 10/29/2004 11:58:03 AM Mountain mjs:: About on track for my earlier analysis. Did overshot 1128. The best trade would be to short from 1129 but no confirmation except my FOP. Wonder if there is a way to trade this more confidently with an indicatior of some type. 10/29/2004 11:56:46 AM Mountain wlj:: low price so far between m and n . then rally up to between n and m .
10/29/2004 11:28:51 AM Mountain prt:: Except for Bonds, every market seems to be asleep - stocks, currencies, commodities. I think the whole world is holding its breath and waiting for the election to be over. 10/29/2004 10:06:17 AM Mountain mjs:: I am seeing balance here with the T180 and H as the channel. The pinch coming up at 14:00 I think sets up a trend trade with my bias dn of course subject to what happens at 13:00. Red tide in control so far. 10/29/2004 9:43:38 AM Mountain mjs:: HUMM, time to think about the 1:00 situation. Expect to stay on Red tide. Mkt seems to be leading it by 30 min. Ques is where to put the FOP, 1st or 2nd top! On 2nd we haven't got to mid point yet on 1st we are past it. 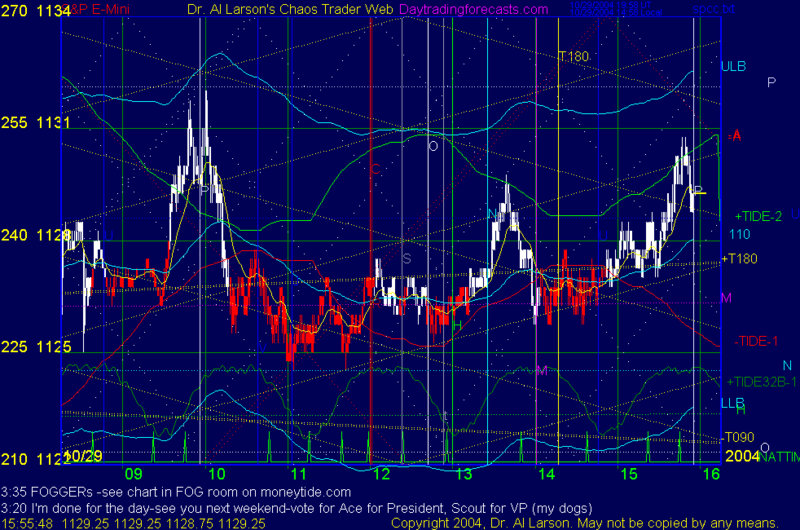 Looks like a bounce up to 1128 (after lunch in NYC) and then dn for rest of day to 1122. 10/29/2004 9:09:43 AM Mountain g9:: How's everybody? 10/29/2004 9:07:53 AM Mountain mjs:: I am using Moon 20, Mercury 63 and Venus 161 EXMAs I like the mid one to call my attention but not sure 161 isn't too far. Does the 110 relate to a cycle? 10/29/2004 8:11:09 AM Mountain mjs:: My FOP is on the 9 day S&P and this run is almost on the limit of the FOP yet still room to go up to 1136. Y'day I estimated 1128 using SPY and my FOP. My idea is now sideways for a while to create room to move up within the FOP. 10/29/2004 8:02:47 AM Mountain mjs:: Red Tide dominated yesterday. Is this a possible Follow the Road day or are the pinches too close. 10/29/2004 7:49:07 AM Mountain mjs:: Up or Dn Today? has the FPb from the 25 finished or is there more to go, may be based on my FOP on 9 day. Was 1131 end of leg and today down. Bradley shows me a camel back top maybe a fireball for the next few days. The Raging Bulls project 12500 for end of year how could we get there. Today still have to figure out up or dn.